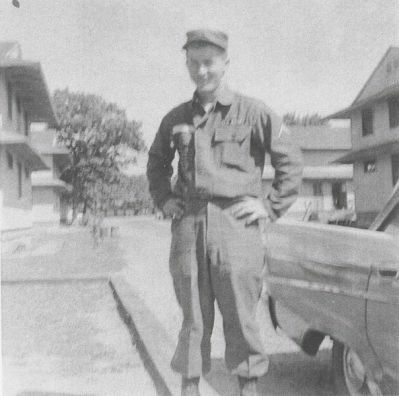 Milo Gardner at US Army code breaking school, Fort Devens, 1957. Milo Gardner may be retired, but he’s not letting his mind rest idle. This amateur code breaker chatted with IMACS about his mathematics background and how it influenced his life. After serving in the United States Army as a cryptanalyst, Milo went on to earn his B.A. in Mathematics with a minor in History of Economic Thought at California State University – Chico. What followed was a career in aerospace engineering and an M.B.A. from CSU – Fullerton. Years later in retirement, Milo’s curious mind, a letter to the editor, and a meeting at a coffee shop led him to his current passion – decoding ancient Egyptian math texts. IMACS blog readers can review his extensive list of online publications on the subject. Now let’s hear from Milo in his own words. Please tell us about your mathematics background, including what interested you as a child. Baseball and sports of all types filled my youth. In the 8th grade I was sports editor of our school newspaper. This meant computing box scores and other game statistics for the various teams and writing up short narratives. Several sports teams were enjoyed during high school. Basketball was my favorite. Math was a special high school interest, as well as Spanish, chess and the sciences. Algebra I, Algebra II, Geometry and Trigonometry were studied in the context of set theory. That is, math students determined in advance which number system(s) would solve particular problems. Right out of high school, the US Army was joined with hopes of spending time in Europe. My high school language skills were tested first. Two entrance exams for the Defense Language Institute at Presidio of Monterey, California, were taken. Luckily, the second exam score was low. The Army’s code-breaking tests followed, which were passed. In a five-month code breaking school, language and number-based patterns were studied. Techniques identified one-to-one, two-for-one, and other substitution systems. Finishing third in a class of 20, Germany was selected as my two-year assignment. Lower ranked students were sent to Africa, Turkey, Korea and Japan. In Germany, ad hoc Russian language projects were assigned to cryptanalyst and linguist teams. A two-month side trip to Lebanon widened my foreign language exposure to include Arabic. Upon discharge from the Army, a number of my co-workers went to work for the National Security Agency (NSA) in Washington, D.C. I went to college in Northern California and earned a Mathematics degree with a minor in History of Economic Thought, with an intention of applying to the NSA. Computer programming courses were taken, as I was preparing to be a high school math teacher as a back-up career. Upon graduation, wishing to be married and raise a family, a southern California aerospace engineer accepted. The pay was better than teaching. Equally important the location kept me and my wife-to-be close to both of our families. What kind of work did you do in the aerospace industry? The first aerospace position was at Vandenberg AFB as a systems analyst. Western missile test range issues input computer-generated data to hand drafted range safety charts. The charts factored in daily wind measurements and drag aspects of missile parts that allowed three-second delays for the missile safety officer to blow up errant missiles. Nearby populations were protected. Subsequently, college programming skills were applied working with a team that automated the hand drafted charts. The second aerospace job was at Rockwell International in Fullerton, California. Failure patterns of Minuteman I, II and other avionics guidance systems were studied in terms of maintainability issues. While at Rockwell, evening business classes were taken towards an MBA degree. Upon graduation, a career change allowed our family move to northern California to be near our respective families. You raised a daughter who went on to become a civil engineer. What advice can you offer to parents of mathematically talented girls on how to nurture their talent? Missy, my CE daughter, was self motivated by the second grade. All three of my children played musical instruments. Parental guidance consisted of coaching youth softball and baseball teams up to age 12 and supporting each child’s active social life. Thereafter, tryouts for competitive teams were arranged. Missy made a traveling team at age 14 in an organization that her older sister played. My wife and I attended most of Missy and her sister’s weekend tournaments. Our children knew their parents were their biggest supporters. Missy was strong willed and stood up to basketball, softball and volleyball coaches in high school. Her sports experience gave her confidence to confront one engineering professor in college who refused to call on women in the class. After receiving a failing grade at mid-term, she called a conference with the professor and asked why he had not taken even a single question from one woman in the class. Her strong position was understood and respected. Thereafter, in-class questions were answered sufficiently for her and other women to earn passing grades. Today, she is an engineer working for a private firm. Incidentally, she told us this story weeks after the situation had occurred. Missy had the confidence to handle it herself. 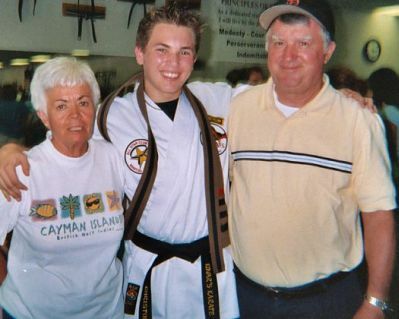 Milo with his wife Bertha and grandson Chris, 2005. In retirement, you now pursue code breaking as a hobby with a specialization in ancient Egyptian math texts. How did you become involved in these pursuits? In 1962, an upper division college history of math class told a fuzzy history of zero story. Zero, as we know it today, did not reach Germany until 1200 AD, in time for the birth of our base 10 decimal system in 1585 AD (that defined n^0 = 1), an unbelievable assertion. “Some day I’ll research that topic,” I told myself. In 1988, six months were spent studying the topic at two local university libraries. Medieval and older Near East numeration systems including Classical Greeks used zero, a round figure topped by two dots in clear ways. Babylonians and Egyptians used zero as a limit 1,500-2,000 years earlier. Zero was also the value of empty sets in an Egyptian double entry accounting system. The older uses of zero did not use placeholders. Care had to be taken to read the context of mathematical documents and inventories –- issues that I knew well as a military code breaker. After completing the study of the longer history of zero, an unexpected event took place. Acting on the dehumanization of classroom math topics (e.g., omitting personal stories like how the pre-teen Gauss summed the addition of 1 to 100 by a formula), I wrote a letter to the editor of the Sacramento Bee on the weaknesses of the 1990 California Math Framework. The day after the letter was published a phone call from a retired electrical engineer was received. Noel Braymer asked that we meet at local coffee shop. I said yes, and my retirement world changed for the better. Noel had worked on 1650 BCE Egyptian text called the Rhind Mathematical Papyrus (RMP) for 15 years. A 50 member RMP 2/n table was encoded. The table took up 1/3 of a papyrus that contained 87 other problems. Noel offered a modern number theory solution to the 2/n table. Number theory stresses prime numbers in ways that ancient and modern mathematicians parse divisors of composite numbers into primes. The ancient 2/7 was recorded as 1/4 + 1/28. What set of ancient rules were used in the entire 2/n table? The 2/n table encoded 2/3, 2/5, …, 2/101 to concise unit fraction series in ways that scholars hotly debated during the 20th century. Robin-Shute published the Rhind Mathematical Papyrus text in 1987 and suggested one incomplete solution. Noel gifted the book to me, and asked if I would assist in publishing his work. I said yes, provided the ancient scribal methods were also decoded and published. Ten years later, working with a linguist, a sister document to the RMP, the Egyptian Mathematical Leather Roll (EMLR), was decoded with modern number theory. Attempting to explain connections between the two documents, aspects of the RMP 2/n table construction methods slowly emerged. Another seven years passed. Finally, by considering Egyptian wages paid in commodities, a 2011 paper included a complete solution to the 2/n table problem as an appendix. In your opinion, what mix of interests and skills makes a person well suited for a career in cryptography? What should kids who are interested in code breaking be doing now to prepare themselves for a career in this field? Students should enjoy solving all types of puzzles. I have loved crossword and other puzzles since high school. Learn a foreign language and learn about new and old foreign mathematical issues. Enjoy competitive individual and team games. Chess and bowling took up much of my free time. Choose your games and puzzles wisely. To pursue a puzzle solving career, a student should learn to contribute to all sorts of teams. Team membership is an important skill in many aspects of the adult world. What’s the secret password to a bright future? IMACS! Take our free aptitude test. Play along with IMACS weekly logic puzzles on Facebook. Editor’s note: The material below is adapted from ‘Book 0 Chapter 1: Operational Systems’ of the Elements of Mathematics series. The EM series of secondary school mathematics textbooks is a 27-volume collection written and published by the IMACS Curriculum Development Group and serves as a basis for the high-level online math courses available through eIMACS, the distance-learning division of IMACS. Notice that the number 12 plays a very special role in Clock 12 addition. When you add 12 to any of the numbers from 1 to 12, the number remains unaffected. For example, 5 +12 12 = 5, 12 +12 12 = 12, etc. 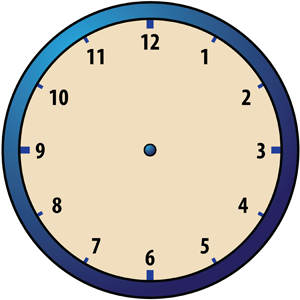 With this slight change from the usual clock face, we can now summarize the situation as follows: Clock 12 addition involves the twelve numbers 0, 1, 2, 3, 4, 5, 6, 7, 8, 9, 10, and 11. We denote this set of the numbers by Z12 (read, “Z sub 12”). Here is the rule for computing x +12 y for any numbers x and y in Z12. In plain English, that means: To find the Clock 12 sum of x and y, first find the ordinary sum of x and y. If this ordinary sum is less than 12, you are finished – the Clock 12 sum is just the ordinary sum. On the other hand, if the ordinary sum is greater than or equal to 12, then subtract 12 from the ordinary sum to get the Clock 12 sum. We have been calling +12 “Clock 12 addition” because it’s very closely related to the kind of adding you do on a real clock. The operation +12 is also called “addition modulo 12” or “addition mod 12” for short. Now we’ll describe a game called “Clock 12” that two players, A and B, can play on a circular board. You’ll need a movable arrow for the hour hand so that your game board looks like the figure below. Player B makes a move in two stages: first by placing a checker of a second color on one of the unoccupied numbers, and then by placing a second checker of the same color in such a way that the following is true: The starting hour plus (mod 12) the number of hours corresponding to Player B’s first checker is equal to the time corresponding to Player B’s second checker. The arrow is then made to point at the number on which Player B’s second checker was placed, thus indicating the new hour. Player B then declares the new hour. Suppose Player A begins the game by placing a checker on 10. Then the hour is 10 o’clock. If Player B chooses 4, then his or her first checker is placed on 4, and the second checker is placed on 2 because 10 +12 4 = 2. The hour hand is then moved to 2 o’clock. Suppose Player A chooses 0. If Player B chooses 4, the first checker is placed on 4. In this case, 0 +12 4 = 4, and Player B already has a checker on 4. Therefore, there is no need to place a second checker on 4, and so Player B’s turn ends with the hour being 4 o’clock. Suppose Player A chooses 10 and Player B chooses 0. 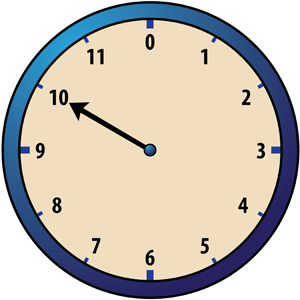 Then, since 10 o’clock plus 0 hours is 10 o’clock, Player B’s second checker ought to be placed on 10. However, Player A’s checker is already on 10. In this situation, Player B takes Player A’s checker and replaces it with one of his or her own. The hour hand, which was pointing to 10 before Player B’s move began, will not be changed. The hour is still 10 o’clock. The players continue to alternate turns using rules described in the examples above. If, after completing his or her turn, a player leaves the board so that there are no more unoccupied numbers, then the game is over and the player with the most checkers on the clock wins! What time is it? Time to take an IMACS class! Sign up for our free aptitude test. Play along with our weekly IMACS logic puzzles on Facebook.